The following is a list of 4-star dog food brands… each containing at least one wet puppy food. 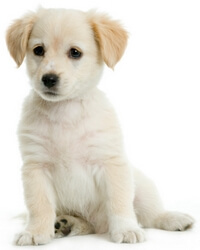 To qualify, each puppy food must meet AAFCO nutritional profiles for either all life stages or growth. Or it must be recommended for puppies by the manufacturer. If you know of a puppy food you believe we should have included on this list, please feel free to share your own suggestions in the Comments section below. Or if you’re looking for some suggestions yourself, be sure to look through our readers’ Comments to find more good ideas. The following is a list of 4-star wet dog food brands that have been found to contain at least one puppy food. Within each brand, look for products that include the word “puppy” in their names. In addition, many other products are designed for all life stages… a group that also includes puppies.